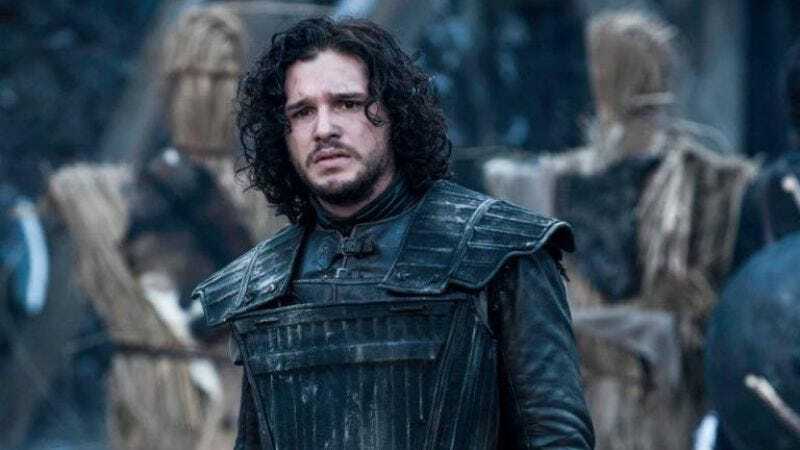 On Game Of Thrones, Kit Harington plays the unflappable do-gooder Jon Snow, a guy who always tries to find the “right” way to do things, no matter what. In fact, he tries so hard to make everyone happy that it got him stabbed in the chest a bunch of times last season. That last bit is a spoiler, but it’s a spoiler that everyone who would willingly click on an article with “Game Of Thrones spoilers” in the headline should already know. Just to be clear, though: Jon Snow died at the end of last season. He got stabbed and collapsed into a pool of blood as the life faded from his eyes. He was dead, dead, dead. But nobody really bought it. Almost as soon as the first knife drew blood, virtually everyone in the world shrugged their shoulders and acknowledged that he’d probably come back to life somehow—and he did, a few episodes ago. Before he was resurrected, though, everyone involved with Game Of Thrones had to keep pushing the official line that Jon Snow was dead and would never be coming back, to the point where Harington himself even felt the need to apologize once the big reveal had aired. It’s a happy ending, thankfully, but it does speak to the excessive amount of power that police officers tend to wield. Let’s just be glad that the cop didn’t really abuse his authority and ask Harington who Jon Snow’s mother is.